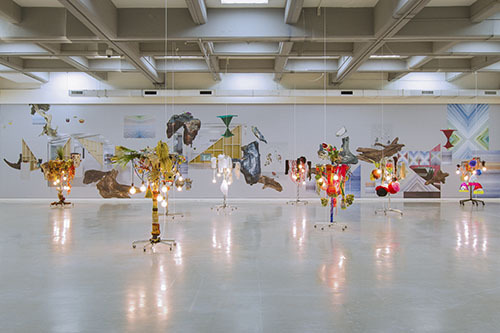 Haegue Yang employs common materials, such as industrially fabricated objects, and narratives of history and personalities to create complex, spatial abstractions, often displayed in intricate installations and sculptures. 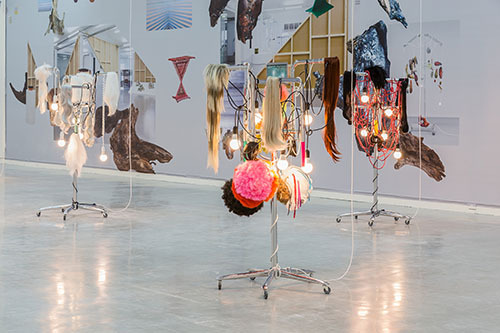 Premiered as part of Warrior Believer Lover in Yang’s solo exhibition “Arrivals” at Kunsthaus Bregenz in 2011, Female Natives and Medicine Men are comprised of 12 anthropomorphic light sculptures. 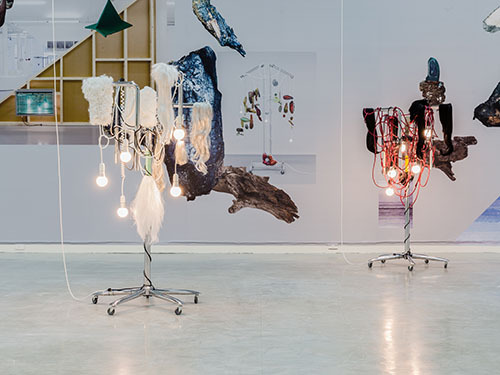 Draped over clothing racks, the extraterrestrial assemblage of industrially manufactured readymades suggests notions of nature and the supernatural embedded in everyday life. 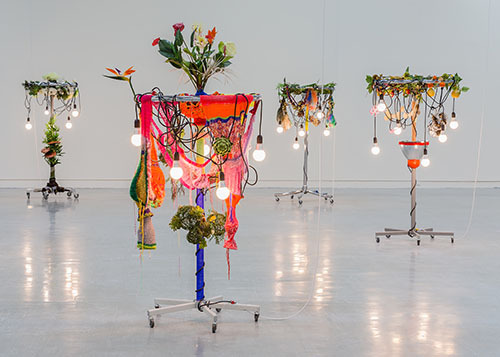 The colorful and artificial plants in Female Natives and the various wigs in its male counterpart, Medicine Men, evoke crisscrossing trade routes and the global migration of commodities and histories. Field of Teleportation, a collaboration with Berlin-based designer Manuel Raeder, wallpapers the space, its zero gravity landscape functioning as a backdrop to a microcosm of flattened works and installation views suspended in space. Known for its primitive cadences, polytonalities and polyrhythms, and Nijinsky’s “almost bestial” ballet choreography characteristic of the Russian avant-garde, Igor Stravinsky’s The Rite of Spring (1913) resonates approximately three times a day, following Islamic prayer times. 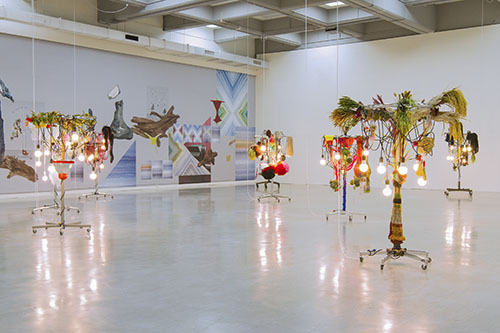 This multifaceted ensemble challenges notions of barbaric and cultivated, exotic and mundane, and spiritual and pagan, juxtaposed by and personified in anthropomorphic sculptures with racks.